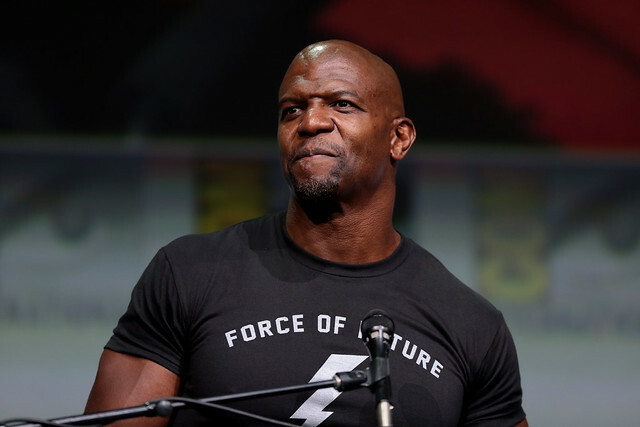 Terry Crews is on the promotion circuit for the fifth season of his television show ‘Brooklyn Nine-Nine’. Sean Evans’ ability to conduct an intriguing interview over eating spicy wings gives a breath of fresh air to stock standard interview tropes. His extremely popular YouTube show ‘Hot Ones’ on the ‘First We Feast’ YouTube channel sees him and the interviewee both eat 10 increasingly hot chicken wings while Evans’ asks a range of questions. Staging an interview over food or beverages isn’t anything new, but the added challenge of completing the ‘Hot Ones wing challenge’ brings a sense of intrigue and a lot of character to the interview. Evans’ interviewing technique is on full display in an interview with actor and comedian, Terry Crews, with Evans’ bouncing off an already extremely charismatic man. Terry Crews is on the show promoting the fifth season of Brooklyn Nine-Nine. Evans clearly does plenty of research before interviewing his guest, combining questions about their career and their personal life – the latter can be an extremely touchy subject but Evans manages to not step on any toes and in turn keeps a positive vibe between him and his guest. Evans brings up the topic of Crews’ son and how he has bonded with him through building a custom computer to help understand his son’s hobbies. Evans stages it as an open-ended question by asking “can you talk to me about not knowing a damn thing about computers to all of a sudden building a state-of-the-art gaming PC with your son?”. He then lets Crews gush about “connecting with his [son’s] world” and how he, 49-years-old at the time, is adapting to a modern world. Evans forms a bond with Crews as they are keeping conversation with the heat of the chicken wings trounced in extremely hot sauce. Evans, a seasoned veteran at this point (four seasons in) can deal with the heat and continues to helm the interview. Crews admits he’s a competitive guy but even he has to commend Evans, exclaiming “You’re pretty good!” after they both eat a 135,600 Scoville chicken wing. Evans barely breaks a sweat. With every spicy wing, Evans changes to a completely new topic, keeping the interview feeling fresh. Hot Ones, where Evans is a co-creator, producer and obviously the host, shows how popular the food-based interview format can be when it is entertaining. The perfect mix between a quick on his feet, affable host in Evans, an interesting and charismatic guest, in this case, Terry Crews, and the challenge of defeating “the wings of death” is a recipe for success. Heath Sheahan is studying the Diploma of Media and Communication at LaTrobe College. You can follow him on twitter @HeathSheahan.